Did you know... That a skilled trades person can earn $25/hour or more? That the construction and trades industries are actively recruiting women and transgender individuals? That on-the-job-training is paid at $12-$24/hour? 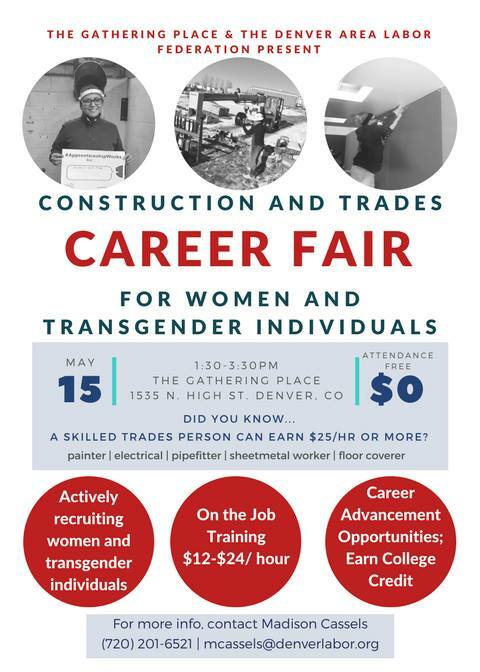 The Gathering Place is excited to partner with the Denver Area Labor Federation to host the Career Fair for Women and Transgender Individuals again this year. The trades are one of the largest employment areas in Colorado and the unions help ensure that trade jobs provide equal pay for equal work - meaning that the trades are a viable career path for many of our members. Representatives from painting, electrical, pipefitting, sheet metal, and general labor trades will be present and some will be hiring. Join us at The Gathering Place on May 8th (1:00pm) to learn more about Union jobs from the Denver Area Labor Federation and then join us again on May 15th (1:30-3:30pm) for the Career Fair (https://www.facebook.com/events/1688359528135234/). If you are interested in attending and aren't already a TGP member, come early (we open at 8:30am) to fill out a short intake form. Find out more about who is eligible to be a TGP member at http://tgpdenver.org/what-we-do/receive-services.html. If you have kids that are not yet school-aged, you can bring them and they will be cared for by our Family Program staff and volunteers while you attend the career fair. Come join us to begin your career in the skilled trades!